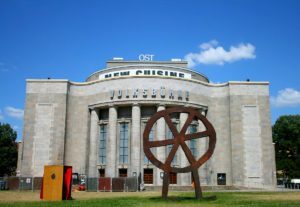 Easter is performing New Cuisine Pt 1 at Berlin’s Volksbühne on June 5. 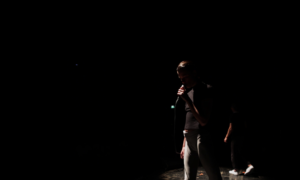 Performing as part of Torstraßen Festival 2016, running June 4 to 5, the Berlin-based producer duo gives little away in terms of what they will present for their live performance named after their 2014 release featuring the titular track ‘New Cuisine Pt 1’, ‘Smar’ and ‘Wok At Ur Show’ among others. The art and music project consisting Stine Omar and Max Boss have been releasing music independently and online since 2011, generating a sizeable following while rarely performing live. More recently, they launched their ‘True Cup’ music video at last year’s inaugural 3hd Festival —with footage filmed at their Sadness is an Evil Gas Inside of Me at Galerie Koal —followed by a live set as part of CTM16’s New Geographies programme. 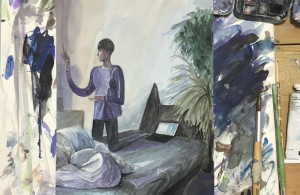 Stine Omar and Max Boss of Easter (or Easterjesus Productions) present the season finale of their video series Sadness is an Evil Gas Inside of Me, featuring new paintings by Charlie Roberts, at Berlin’s Galerie Koal from November 4 to December 5. The series sidesteps a lot of the mechanisms and features inherent to its form—there is little spoken dialogue and in its place is a set of disembodied voices narrating or accompanying mysterious events. Sometimes, the dialogue that is there is simply the end of a commercial that has bled into the video piece, further blurring the form itself. It is, as Vika Kirchenbauer writes in the introductory text, “a soap opera in the guise of an essay film, or an essay film in soap opera drag”. Omar and Boss use “video as its own form of writing”, supplementing their music (as Easter playing at 3hd Festival in December) with an experimental series “where the unsayable finds shape and expression”.